Known for his online poker training and videos, Hunter Cichy is a young poker professional who has a very analytical approach to no-limit hold'em. Primarily a cash game player, Cichy is also known to travel to compete in major events and has seen tournament success both live and online. In his book "Advanced Concepts in No-Limit Hold'em: A Modern Approach to Poker Analysis” you will discover what criteria the author sets himself and how he proceeds with his hands in a game of no-limit hold'em.
" Advanced Concepts in No-Limit Hold'em" dives straight into the math of poker. While the "Imperfect Information" introduction explains the similarities and differences between poker, chess and backgammon, a lot of the basic odds are featured to demonstrate how complicated a game poker is. This sets the scene for the first section 'The Math' which delves deeper into different types of equities, pot and implied odds and combinatorics. The next section, 'Pre-flop' explains how Cichy chooses when and how he enters a hand, before finishing with "Post Flop", which covers all the nuances of actions on later streets. These latter two parts continue with a fair amount of number work, although several other considerations are also included. This book is definitely one for math fans. All the basic calculations you need to play no-limit hold'em are there, along with a fascinating breakdown of hand ranges and practical adjustments for when you get onto the tables. 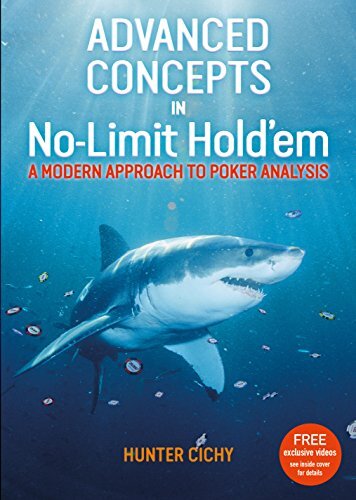 However "Advanced Concepts in No-Limit Hold'em" does not read like a text book, but flows well with the different subjects delivered in small sections along with charts and graphics, relaying Cichy's theories an easy to understand format. This makes the book very accessible to anyone who knows the basics of poker, and there really is something in here for everyone regardless of their ability. In the days where online poker forums, training videos and applications have greatly accelerated poker theory, books have been disregarded by many. Despite this, and in part because of these advances, Hunter Cichy has created a must-read book for the modern poker era. If you struggle with the numbers, or want to progress your overall thinking about the game then "Advanced Concepts in No-Limit Hold'em" is for you. The book is both very accessible while being extremely informative, and will benefit players of all levels.